Third-year tight end Nick Vannett embraced Pilates to help treat a herniated disc in his back. Months later, he's having his best season in Seattle. 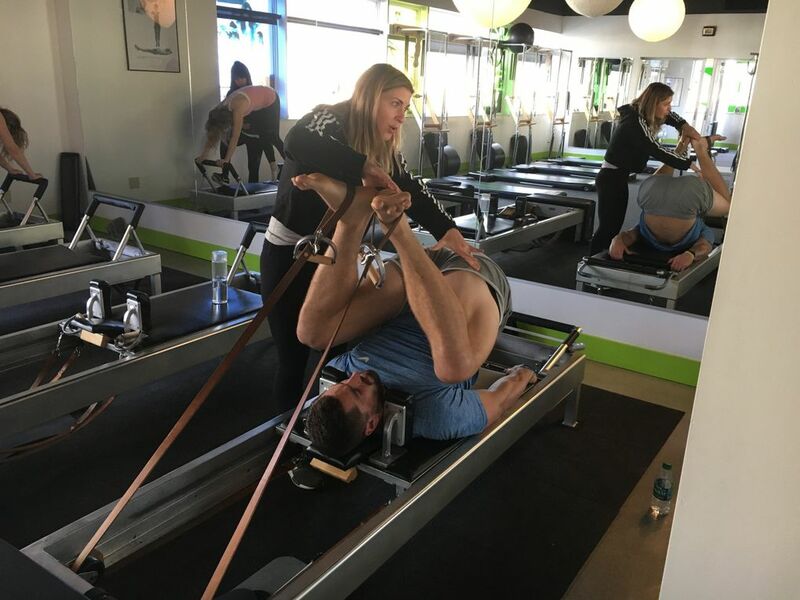 We tagged along to find out what a Pilates class with an NFL tight end really looks like. There’s an old poster pasted to the wall inside Nancy Wallace’s Pilates studio. “Now YOU can stay young longer,” it reads in bold black ink, beside a photo of shirtless 78-year-old trainer Joseph Pilates staring serenely into the distance. At the bottom of the framed black-and-white poster — just below a photo of Pilates laying on his back, hands behind his head, smile stretched across his face, trim physique obscured only by a lonely pair of black briefs — a quote is attributed to the since-deceased and world-renowned German trainer. By that logic, Nick Vannett is practically ready for retirement. Or, at least, he was. Throughout his first two seasons in Seattle, the 6-foot-6, 261-pound tight end dealt with a herniated disc in his lower back, which was so painful that he said this offseason it was sometimes difficult to “bend into a three-point stance. Been times I could barely run out of a cut.” After suffering another setback during the Seahawks’ final OTA in early June, the abnormally achy 25 year old started to feel like he was running out of options. For those unfamiliar, Pilates is an exercise system built around controlled movements, designed to further develop flexibility and core strength and improve one’s body control and endurance. During the season, Vannett grinds, stretches and suffers for a full hour one to two times per week at Nancy Wallace Pilates in Bellevue. And since he first adopted Pilates this summer, Vannett has turned in easily his best season as a Seahawk, piling up 21 catches for 203 yards and two touchdowns (all career highs) in just nine games. For Vannett, at least, Pilates has equaled production. “Just being able to run and kind of grip the ground, it just gets your hips right. It gets everything in your core right,” said Vannett, who has played in nine of 10 games this season but did miss the win over Oakland on Oct. 14 when he suffered a minor setback. “Even just walking around, I can feel the difference. It really just feels like I’m lighter on my feet, because my core is more activated now and it’s honing everything in and taking more of the load as opposed to my quads and my hammies and all of that. So what, exactly, does a Pilates session with an NFL tight end really look like? The Times tagged along with Vannett on a recent Friday, climbing the stairs (past many more Joseph Pilates photos) to Wallace’s second-floor studio. Once inside, the Seahawks’ starting tight end — who caught extra passes from Russell Wilson after practice less than an hour earlier — changed into a blue mesh shirt and gray shorts and ditched his socks and shoes. Then he lay on a sliding metal machine called “The Reformer,” and the contortions commenced. On this Friday, Vannett curled into a ball on his back, placed elastic bands around his feet and then stretched his legs over his head, sliding forward and back while taking deep, stressed breaths. He sat on a machine deceptively called “The Cadillac,” gripped coiled bands with both hands and then bent backward against the resistance. At one point he laid on his back, with his legs straight in the air, and basically bench-pressed a thin metal bar with his toes. And all the while, Wallace stood beside him, or in front of him, or behind him — or, at least once, she literally stood on top of him — firing a steady stream of directions as Vannett silently contorted and complied. Don’t sink into your lower back. Scoop the stomach. Stack the spine. Drop the shoulders. Tuck that tailbone more. Tuck it. Tuck it. Tuck it. I don’t want to be able to eat dinner on your back. Make the bottom of your feet act like a snake and they’re slithering. “Oh, this isn’t working?” a breathless Vannett said with a sarcastic smile. Therein lies the break between perception and reality. It’s true, Pilates is practiced most frequently by women and the elderly. It’s also true that the silhouette of butterflies are engraved into the clear sliding doors at Wallace’s studio. When it comes to Pilates, appearances aren’t everything. “The mentality that only women or old people do Pilates … I mean, it’s true. Nick’s like the only (young) guy in here doing it,” Wallace said. “But I really think that that should change to marathon runners, cyclists … everybody. And now she has a tight end who has caught a touchdown pass in two of his last three games. “In terms of stigma or the mentality, we’re in the United States,” Wallace continued. “Everything here is about exercise fads or diets or doing the latest whatever that’s going to get you the fastest results. This particular race mercifully ended at 3:44 p.m. on Friday, Nov. 9, a day before the Seahawks flew south for a divisional matchup with the Los Angeles Rams. Vannett slowly lifted himself off the mat, his blue shirt a shade darker than it was an hour earlier. “How do you feel?” Wallace asked.